Home / Resources / Newsletter / ONTRAC 51. Theory of Change – what’s it all about? This issue of ONTRAC looks at ‘Theory of Change’: another ‘new’ idea that has become increasingly popular in the development sector in recent years. Maureen O’Flynn first provides an overview of Theories of Change – what they are; how and why they were developed; how they relate to other methods of assessing impact; and how they can support effective development. The four articles that follow provide experiences and applications of Theories of Change across differing contexts. James Treasure-Evans outlines the development of Concern Universal’s Theory of Change, and the challenges and benefits that they found during the process. Stephen Fraser, writing about the experiences of the SAVI programme in Nigeria, emphasises how developing a Theory of Change can help programmes to retain a focus on processes. Duncan Green provides an alternative approach to developing a theory of social change, describing how an Oxfam programme in Tanzania took on an evolutionary acceleration approach to its work on accountability. 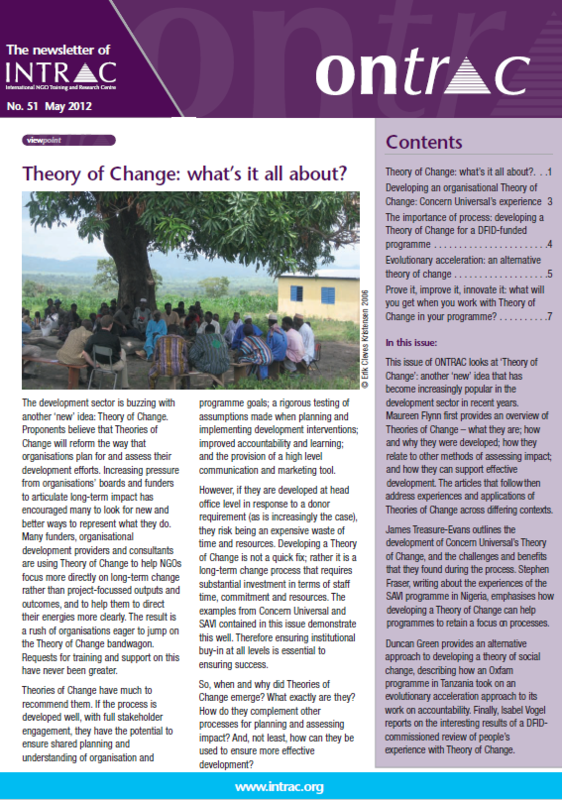 Finally, Isabel Vogel reports on the interesting results of a DFID-commissioned review of people’s experience with Theory of Change. ONTRAC 51: Theory of Change - what's it all about?